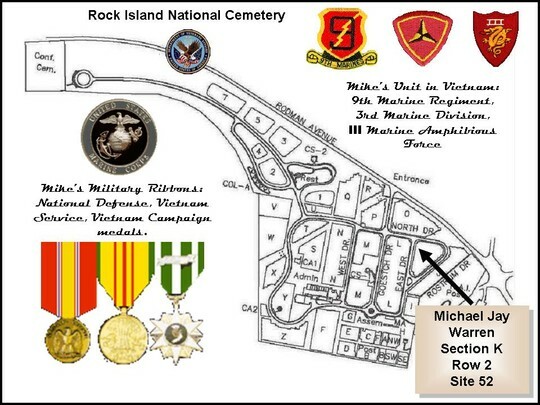 As far as we know, Mike is the only member of the MHS Class of 1962 whose name is on the Vietnam Memorial Wall in Washington, D.C. The following is the official information about his service in Vietnam. 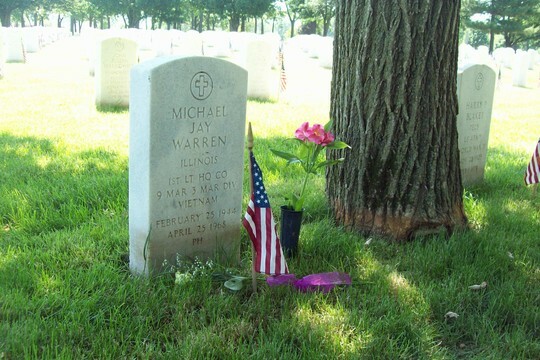 Mike is interred at the Rock Island National Cemetery on Rock Island Arsenal Island. The picture of Mike's grave was taken over the Memorial Day weekend 2010. 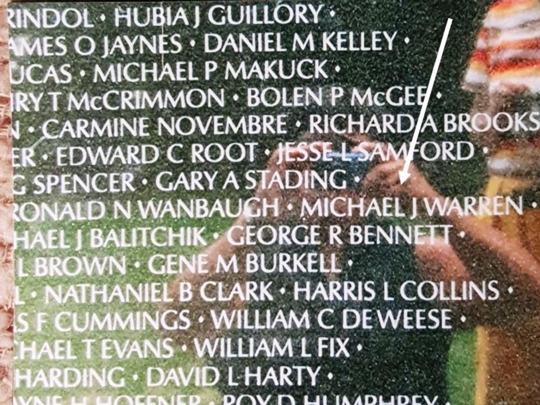 Fellow MHS classmate, Jon Schiewe provided the picture he took of Mike's name engraved on the Vietnam Memorial in Washington, DC. 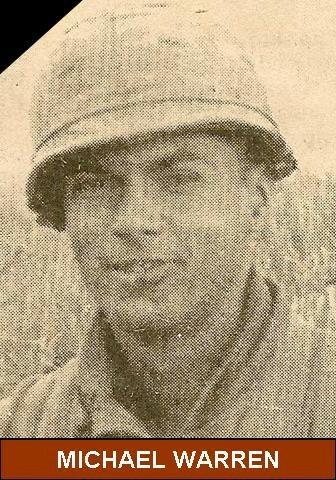 Mike entered the USMC Basic Officer Course with the class of 5-67 in May of 1967 and graduated in August of 1967. 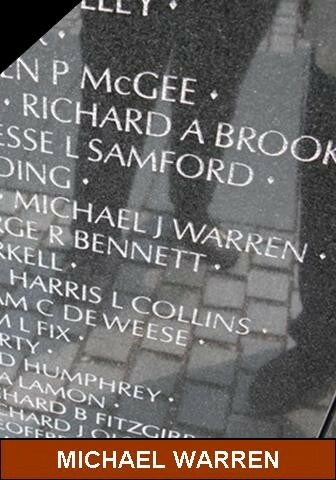 43 young men from that class of 516 died in Vietnam. There is a monument to these men at the National Museum of the Marine Corps. Mike's name is on this monument. It is located in Triangle, Virginia, near Quantico. Yes, I wholeheartedly agree. A scholarship fund would be a wonderful idea! ALL, I think Stuart has an excellent idea! 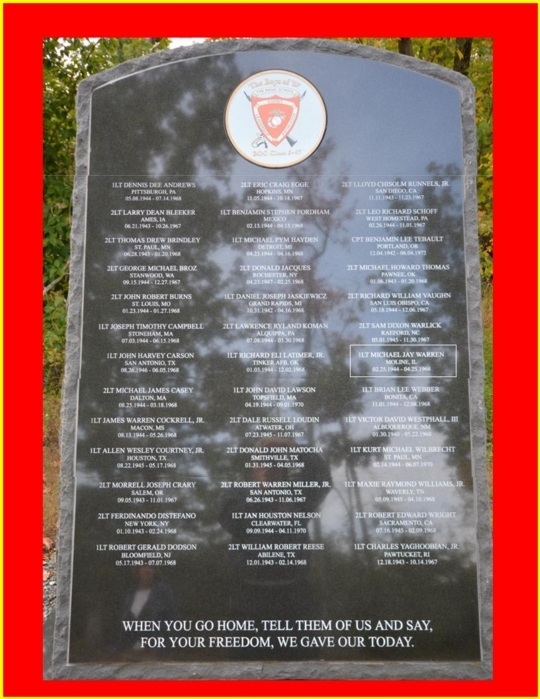 I had a email discussion with Phil Nissen and he made a good point, are their any other MHS "62" military Veterans who passed on active duty during Vietnam, Mauyeques (sp), Panama, Balkans, Granada, and maybe Desert Storm...? Rick Andeson maybe able to sort data better than I, but after a basic "cut & paste" type check of classmates, it appears Mike Warren is the only one. 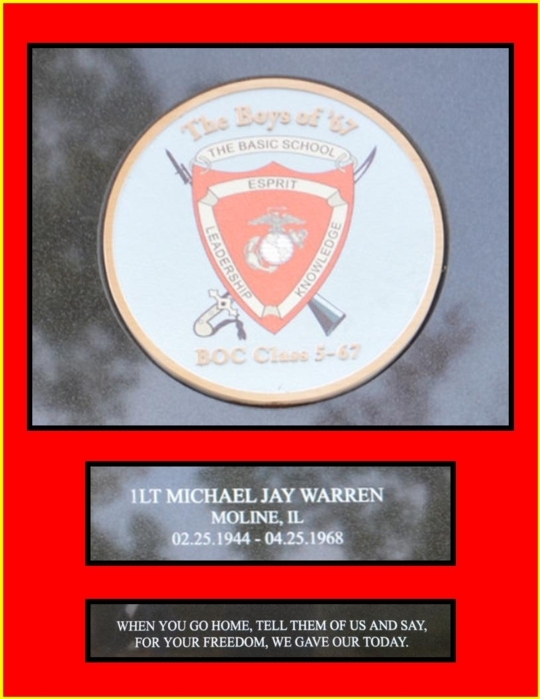 The thought being that if their are other classmates who died during active duty military the scholarship fund could be for all MHS 62 Veterans who passed while serving. Either way count me in! Mike is our only class member who lost his life while on active duty. Stuart's idea is excellent and I'm sorry the rest of us did not think of it earlier who knew Mike so well. I suggest that Stu and Woody and Rick get together to set this up. It does take a little work. You will need a 3rd party administrator or a community foundation, a 503c form for tax deductable donations, what total award distributions will be, and how much fund money will be needed to sustain the future distributions. I will gladly donate if we want to get this going. Again, great idea Stu. post an address and I'll be glad to contribute to a scholrship fund in Mike's name. Everyone: Stu, Rick Court and I will soon begin discussing/planning setting up the Mike Warren Scholarship Fund. We will keep you all informed of the progress. Thanks! UPDATE: The Moline Foundation is assisting us with the Scholarship Fund in memory of Mike. They are also currently administrating scholarships through MHS Class of '59 & '65 and are quite experienced, qualified & trustworthy. More updates to follow as we progress through this process. Our heartfelt thanks go out to all you class members who are interested in supporting this endeavor. We can't think of a better way to honor Mike.